Предлагаем к чтению аннотацию, описание, краткое содержание или предисловие (зависит от того, что написал сам автор книги «Two Cousins of Azov»). Если вы не нашли необходимую информацию о книге — напишите в комментариях, мы постараемся отыскать её. Кто написал Two Cousins of Azov? Узнайте фамилию, как зовут автора книги и список всех его произведений по сериям. Ниже представлен текст книги, разбитый по страницам. Система автоматического сохранения места последней прочитанной страницы, позволяет с удобством читать онлайн бесплатно книгу «Two Cousins of Azov», без необходимости каждый раз заново искать на чём Вы остановились. Не бойтесь закрыть страницу, как только Вы зайдёте на неё снова — увидите то же место, на котором закончили чтение. A fortnight after the rabbit incident, Gor was standing at the table in his kitchen waiting for water to boil for his lunchtime egg, and scratching his head with a thoroughly chewed pencil. The crossword before him lay unresolved, the fluffy white cat at his feet virtually ignored. The egg nestled, still cold, in his palm. He was distracted, gazing out of the window with unseeing eyes, the gloominess of his inner thoughts reflected in their murky depths. A dog howled. A crow cawed. He shuddered, brows drawing tight. Perhaps he should fetch his jerkin? This was it: autumn was moving in all around him – its bags unpacked, its toothbrush already in the glass above the basin. The daylight that splashed across his thin canvas slippers held an unhealthy pallor. He sniffed: the essence of the rain-washed ground was percolating the walls. A chill would not do. He was letting himself go. The pencil dropped to the table and he strode from the room. He would unearth his autumn slippers a few weeks earlier than usual, and gain a drop of solace from mildly cosy toes. Gor did not mind autumn so much. He was not sentimental about the seasons, and neither missed them nor anticipated their return. Each dawn came later, and the days seemed worn out, fading to dusk before the birds had finished singing. This put a strain on his light-bulb supply, but it rarely strained his nerves. Autumn was a quick and mucky deal, transforming summer’s dust to cold dirt within a matter of weeks. The alchemy hinged on a drop of three degrees and some extra millimetres of rain. But it was just the cycle of life. It was good to be rid of summer’s heat, Gor muttered to himself. The humidity had been stifling, especially at night. Sometimes, tossing and turning in the fug of summer’s stillness, he had the strangest feeling, as if he were in the wrong place, and were the wrong kind of creature. It was a different sense, not hearing or taste or smell, but a physical memory, printed in his bones. He almost felt he had wings; could feel them unfurling from his back, the effortless rise and fall as he swooped above the earth. He sensed he should be someone else. It made his stomach contract, like a long-forgotten promise: yes, I will be good; yes, I will be true. It made him yearn to nest somewhere high and stony, bone-dry. Perhaps it was his Armenian roots finally tugging him back to the landscapes of his forefathers. The southern Russian town of Azov, his current domicile, was not his natural habitat, after all. It sweated or shivered on windy, salt-marsh flats where the mighty River Don emptied into the shallow Azov Sea. From the top of the ancient ramparts, you could see the water glisten and heave in the distance under a fierce sky, while Azov steamed under a cloud of midges. And Armenia itself had nothing to do with the sea, sitting noble and remote, glorious and resplendent in separateness, its barricades the mountains that rose up on each side, while its sinuous back arched to heaven, veined with dusty roads that twisted into the very sky. He sat in the hall, rummaged in the shoe box and eventually tugged on the autumn slippers, their leather outers shiny with age, the inners enveloping his soles in the softest lamb’s wool. Maybe one day he would return to the land of his ancestors, well, one half of them, and sit on an Armenian mountain. He would mark out the spot with his graphite eye where a tree would be planted in a pebble-strewn valley. On a stretch of flat earth by that tree, he would fashion an Armenian house, with high brown walls and elegant arched windows. He would grow vines and till that difficult soil to bring about a richness of fruits, juicing the earth. But then again, maybe not. He had visited the country only once, in his youth, to meet strange, distant relatives and see what he was missing. He had enjoyed the trip, as far as he recalled, but had never made the journey back despite his intentions. Life had got serious, and his priorities had changed. Take his career at the bank, for instance. It had flourished quickly, weaving roots that would keep him firmly embedded in the local soil. And now, many of those he had met would no longer be walking souls: they were probably buried under the trees in the valley, resting in that dry, sandy earth. For him, time was getting late to be building a house and learning a new language. He sighed and returned to the kitchen, the bold figures of the wall calendar catching his eye, smirking at him as Pericles twisted at his ankles. A timid X marked that first Friday in September, when he had made his move and taken fate into his own hands. A deeper slash of an X denoted the day, two weeks later, when things had gone very wrong. Now, he stood before the calendar, tugging hard on his goatee beard and, with a frown, took the pencil to mark another X four days after that. The date of the rabbit incident. The day he met Sveta. He shuddered, despite the lamb’s wool slippers, and realised he had been ignoring both the crossword and the egg. He could not abide a dry egg. He went to remove it from the pan and stopped short, mouth dropping open. The pan was empty, boiling away merrily to itself with no sign of an egg in it at all. But he had put the egg in there just moments ago, before going into the hall. He had heard it gently boiling away! He was sure his fingertips still felt cold where they had rested on its smooth, hard surface. He looked around, feeling stupid: where could it have gone? Pericles opened an eye and observed his master probing the oven, the cabinet, the larder, the empty biscuit jar, all the cupboards: all for nothing. There was no egg. Gor’s eyes strayed up to the light fittings and down to the floor, not searching, but wandering. He stood motionless and unsure of himself, staring into the pan of boiling water as it giggled back at him, winking. What was going on? Things did not just disappear. There must be a logical explanation. He opened the heavy fridge door: yes, there was the egg container, and there was the space left by the egg he had removed precisely six minutes before, or a little longer, come to think of it. Tuesday’s egg was definitely gone. He slammed the fridge with more force than was necessary and shut off the gas under the pan. He didn’t care for this at all. The last thing he could afford was the loss of a nutritious egg. To hell with it: he’d just have to have tea with a piece of buttered bread. After all, he’d survived without eggs before, and much besides, although admittedly a long time ago, back in Siberia. He was about to sit down to his meagre luncheon when the telephone changed his plans with a harsh and repeated bleeping. He hesitated, buttered bread in hand, wondering who it might be. Still it bleeped. He hurried out into the hall. ‘Good day!’ he pronounced grimly, his deep voice booming off the walls. Представляем Вашему вниманию похожие книги на «Two Cousins of Azov» списком для выбора. Мы отобрали схожую по названию и смыслу литературу в надежде предоставить читателям больше вариантов отыскать новые, интересные, ещё не прочитанные произведения. 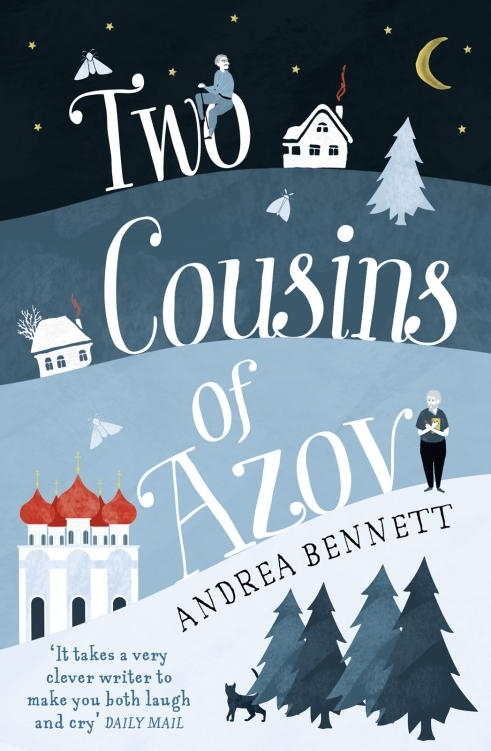 Обсуждение, отзывы о книге «Two Cousins of Azov» и просто собственные мнения читателей. Оставьте ваши комментарии, напишите, что Вы думаете о произведении, его смысле или главных героях. Укажите что конкретно понравилось, а что нет, и почему Вы так считаете.